Forty percent of SESP undergraduates study abroad. In fact, SESP is second only to Medill for the percentage of students studying abroad, and social policy is one of the top 10 majors at Northwestern for study abroad. What attracts SESP students to the experience? At a recent panel discussion, juniors Aria Fiat and Adriana Stanovici pointed out the advantages of study abroad and offered advice on how to make the most of the experience. Fiat recently returned from eight weeks of study at the Sorbonne in Paris, and Stanovici studied at the University of Seville in Spain. Their destinations are typical for SESP students. Europe is the top destination for SESP students — as it is by far for all Northwestern students — and France and Spain are the top two countries. Next in popularity are England, China, South Africa and Argentina. “Everyone has to study abroad! It’s such a fantastic experience,” Fiat enthused. “Exposure to a different culture is invaluable. You are constantly learning and absorbing. Everything from crossing a street to going to a café is a learning experience. … Having that immersive experience is really positive." Stanovici said she had never heard of anyone who regretted the experience; on the other hand, she had heard many who regretted not doing it. “It’s definitely something you should consider doing,” she advised. “Learning how to cross those cultural lines opens up your perspective,” she noted. “You get a different framework that can lead to changes,” especially from meeting people with a different perspective. Stanovici chose the Junior Year in Spain program largely because she speaks Spanish and is considering relocating to Europe someday since her family has roots in Romania. She advised applicants to think about why they want to study abroad and whether a program is a good fit for them. Fiat, who chose IES Abroad, had always wanted to study in Paris. “I wanted a fun break, a new adventure, and it was completely OK that it didn’t tie back,” she says. Since some programs are more defined than others, “it’s important to find out how a program is structured,” she said. She also advised students who are considering the experience to choose a Northwestern-affiliated program and talk with undergrads who have completed the program. With any program, both juniors advised students to take the initiative to make sure they get what they want. When her homestay was a bit of a setback, Stanovici compensated by volunteering for a homeless organization. “It was one of the best things I did there,” she said. Fiat also emphasized the value of integrating course work and travel experiences. “Once I could learn about things and connect back, it made it more valuable,” she noted. Stanovici gave the example of a walking tour of Seville that reinforced her art history course. Both recounted “annoying” aspects of their experiences, including frustration with aspects of the programs and elements that didn’t meet their expectations. In response to a question about sexual harassment, Fiat emphasized the importance of staying safe but added, “Take it in cultural context. Reframe the situation, and use it as a learning experience. … Remind yourself, ‘this is what women here deal with every day.’” Stanovici gave the example of a visit to Morocco, where she and her friends were treated differently as unaccompanied women. Study abroad can be more challenging but also more enriching, she maintained. From an academic viewpoint, there are other issues to think about. For example, assistant dean of student affairs Susan Olson advised students to “get things in writing” to make sure that credits transfer to Northwestern. Other study abroad advice from the dean is to “take something interesting and unique to that place” and to think about saving distributional requirements for study abroad since courses in one’s major may not be available. Both Fiat and Stanovici wished they had been able to stay longer. “Three months is a good starting point, but I feel you need a year,” Fiat noted. “By the time I left, all the pieces were finally in place,” said Stanovici. At Northwestern, the trend is toward increased study abroad, with 34 percent of Northwestern students opting for the experience in 2010-11. Fall has always been the most popular quarter for study abroad, and while full-year study has slowly declined, summer study is increasing. In 2010-11, the percentage of students studying abroad in Africa grew to 9.3 percent and in South America to 11.5 percent. SESP students can find Study Abroad information on the undergraduate website and through the Northwestern Study Abroad office. 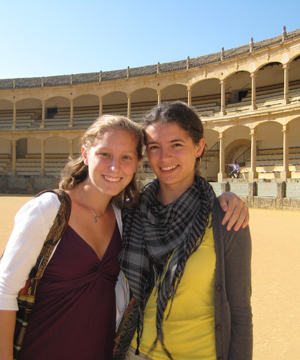 Adriana Stanovici (right) studied abroad in Spain during fall quarter.